This webinar presents an overview of a comprehensive school safety assessment approach for students whose behavior raises concern about their potential for violence. 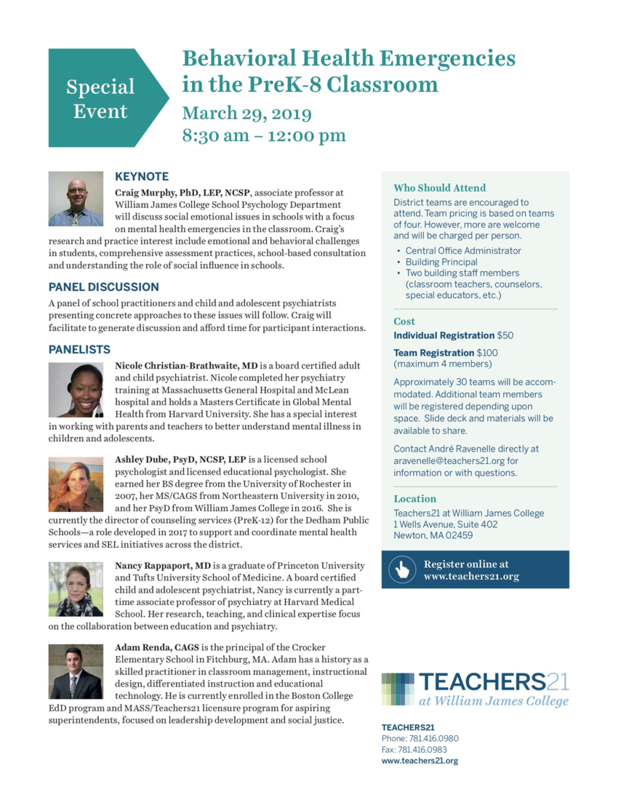 This presentation will draw from Dr. Rappaport’s research and clinical work as a child psychiatrist consulting to schools to present a model that can help prevent school violence while getting students and families the services they need. Targeted school violence is rare, making schools relatively safe places. However, every school must assess be familiar with basic concepts for quickly and comprehensively assessing the safety of students who are volatile and may make threats, write a hit list, destroy property, or post concerning content online. The safety assessment model emphasizes understanding the context of the behavior and helping adults mobilize the resources needed to address the student’s and family’s needs and enhance the student’s safety, connection, and well-being. 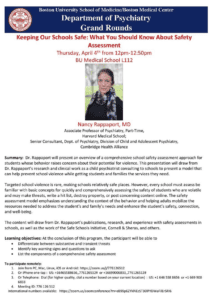 The content will draw from Dr. Rappaport’s publications, research, and experience with safety assessments in schools, as well as the work of the Safe Schools Initiative, Cornell & Sheras, and others. 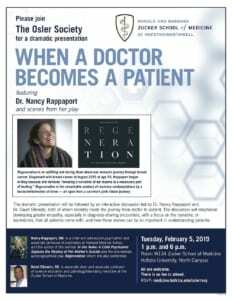 The dramatic presentation will be followed by an interactive discussion led by Dr. Nancy Rappaport and Dr. David Elkowitz, both of whom recently made the journey from doctor to patient. The discussion will emphasize developing greater empathy, especially in diagnosis-sharing encounters, with a focus on the narrative, or backstories, that all patients come with, and how those stories can be so important in understanding patients. Two-day Training through PESI, 12/5-6/2018 – in person in Dedham, MA or via webcast! 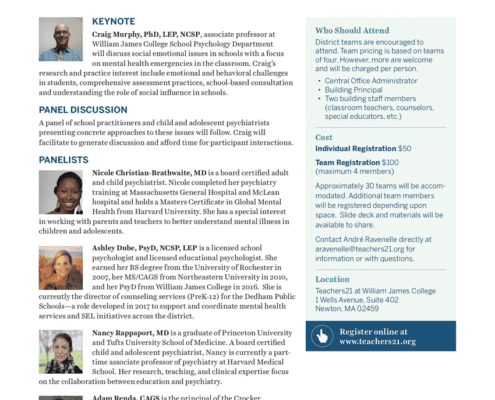 ‘Understanding Adolescent Trauma Through Authentic Connection’ is a one-day symposium designed for professionals in the addictions and behavioral health fields — primarily addiction/mental health counselors, social workers, psychologists, and family therapists. 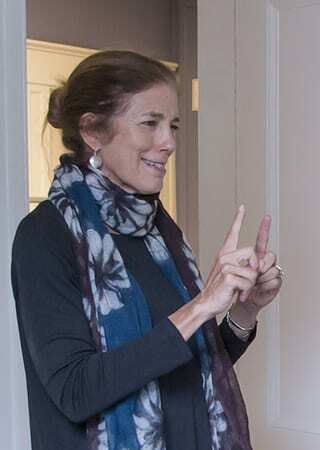 Nancy Rappaport is a board certified child and adolescent psychiatrist and is currently a part-time associate professor of psychiatry at Harvard Medical School. Her research, teaching, and clinical expertise focus on the collaboration between education and psychiatry. Working as a science teacher at an innovative elementary school in Harlem, NY where she advocated for support for struggling families was a life-altering experience and inspired her to enter medical school. Dr. Rappaport received the American Academy of Child and Adolescent Psychiatry’s Sidney Berman Award for the School-Based Study and Treatment of Learning Disorders and Mental Illness in 2012. She also received Cambridge Health Alliance’s Art of Healing Award in 2013—an award given to one who “transcends boundaries, joyfully embraces humanity, and profoundly inspires the healing of body and spirit. Many children face adversity with traumatic abuse, neglect, or special needs that often leads to apathy, learning problems, or aggressive behavior. 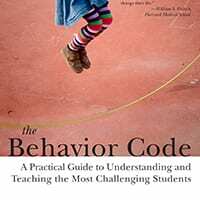 Dr. Rappaport, author of the influential book The Behavior Code: A Practical Guide to Understanding and Teaching the Most Challenging Students, will present the FAIR plan method: a comprehensive, accessible, and flexible framework for intervention with traumatized children and their caregivers. This method of understanding and improving behavior in challenging students looks at the function of the behavior, accommodations, interventions, and nurturing responses to traumatized children, with an emphasis on building relationships. 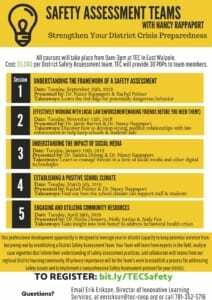 TEC is partnering with Dr. Nancy Rappaport to offer a year long Professional Development opportunity designed to leverage your in-district capacity to keep potential violence from becoming real by establishing a Safety Assessment Team and implementing a formal framework of threat assessment and intervention. Your team will learn from expert speakers, collaborate with teams from districts across our regional learning community and work together to design and implement a comprehensive Safety Assessment protocol for your district.